Recently there are some news about two phones which belongs to Motorola and code named the DROID "Clark" and the other model is code named the DROID "Kinzie." The former has a front panel similar to the Motorola DROID Turbo with its 5.2-inch 1440 x 2560 resolution display, and will be driven by the Snapdragon 808 SoC. The "Kinzie," which sports a model number of XT1585, just went through the GFXBench benchmark site which allows us to pass along some of the handset's specs to you. The Motorola DROID "Kinzie" features a 5.5-inch display with a 1440 x 2560 resolution screen. That works out to a pixel density of 534ppi. 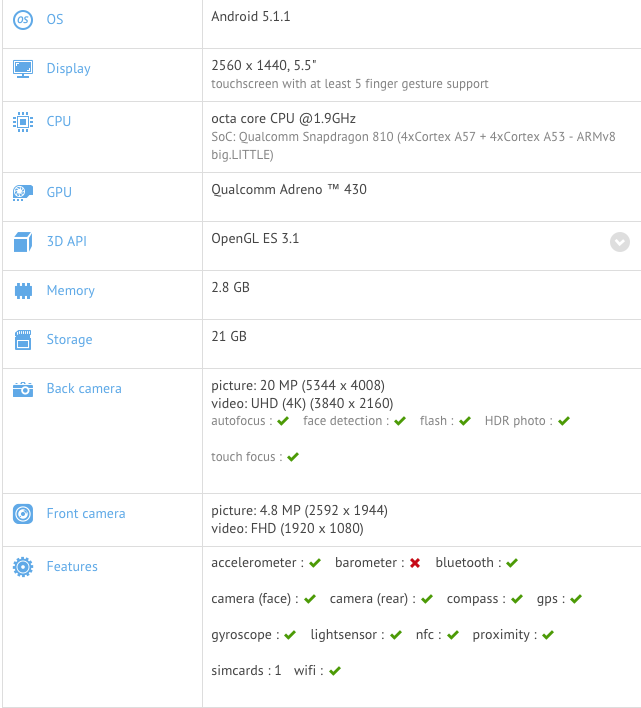 Confirming earlier rumors, the handset is powered by the Snapdragon 810 SoC. The chipset features an octa-core 1.9GHz CPU and the Adreno 430 GPU. 3GB of RAM is inside along with 32GB of internal storage. The back/front camera combo weighs in at 20MP/5MP, and Android 5.1.1 is pre-installed. This could be Motorola's alpha DROID for the year with a bigger screen, newer processor and an improved selfie snapper up front. It should be interesting to see where the other DROID model, the "Clark," fits into this scenario. We have our ears to the ground and as soon as we hear more on the two DROIDS, we will pass it along to you.